This section outlines how to setup your servers/hosts to access QuantaStor Network Shares via the NFS protocol. Unlike CIFS, access control via NFS is managed by providing access to a specific set of IP addresses. The default permissions for new Network Shares is to provide public access from all IP addresses which is shown in the QuantaStor web UI as a [public] network share client entry. The default access control configuration is also to "squash" rights from remote "root" user accounts to the "nobody" user ID as a security precaution. This may cause problems with some applications, and in those cases you can apply the 'no_root_squash' custom option to your network share. Also, if you've changed it to NFS v4 then the 'no_root_squash' option may also be required unless you've manually configured the system to use Kerberos user authentication. To configure the 'no_root_squash' option first go the the QuantaStor web management interface and expand the tree where you see Network Shares. In this example, 'media001' and under there you'll see a host access entry called \[public\]. Right-click on that and choose 'Modify Host Access..'. In this screen input no_root_squash into the Custom NFS Export Options section. This will allow you to modify files in the share. Second you'll probably want to enable 'Async Writes' which will boost performance a bit. Once you're done click 'OK'. Note that we've added the -t nfs4 option, and second we have excluded the /export prefix to the mount path. That's important, do not try mounting a nfs4 network share with the /export prefix. It may work for awhile but you will inevitably have problems with this. This generates a small amount of periodic activity on the active shares so that the connections do not get dropped and you don't get stale file handles. CentOS 5.5 has the 2.6.18 kernel which is several years old now and we don't see this problem with the newer kernels used in CentOS 6.x. 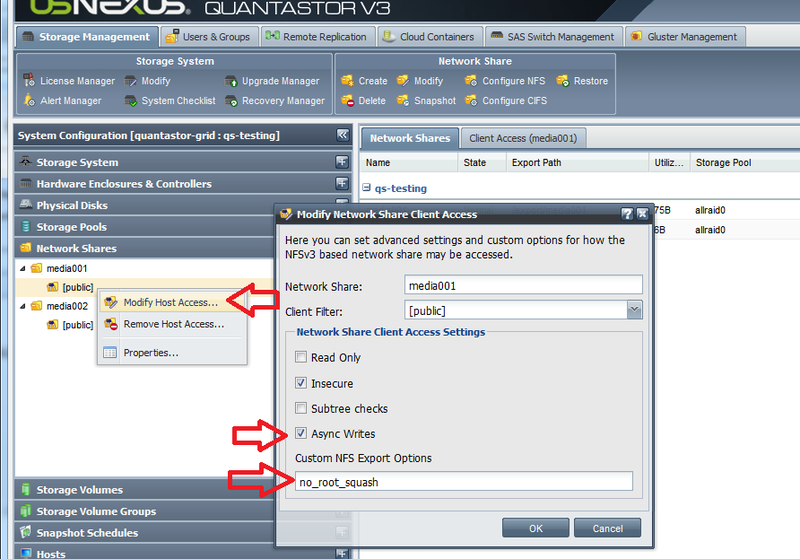 Once NFS is installed you can now mount the Network Shares that you've created in your QuantaStor system. To do this first create a directory to mount the share to. In this example our share name is 'media001'. This page was last modified on 21 March 2019, at 18:30.